Julie Dionne Harbour says her own style doesn’t fit neatly into any box, because you never know what to expect from her from one day to the next. 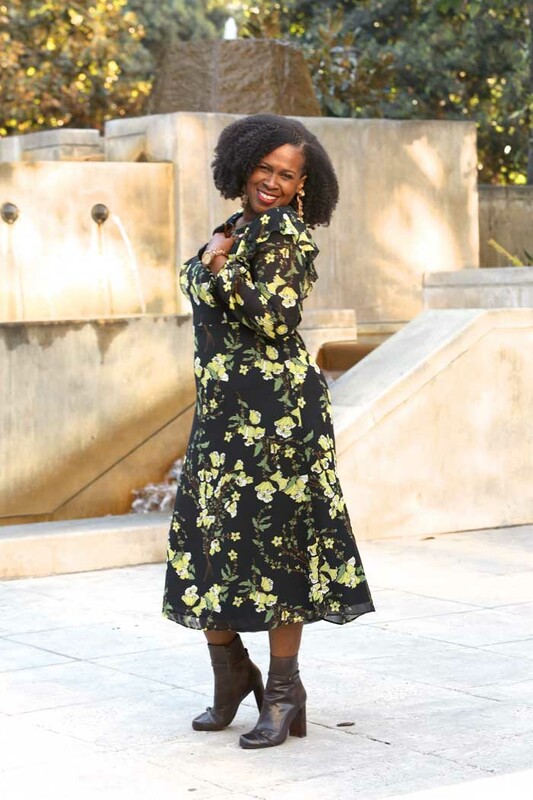 But, no matter what she’s wearing on any given day, she’s determined to crush negative perceptions about aging with style. Let’s find out more about the style rules she lives by! Sure! 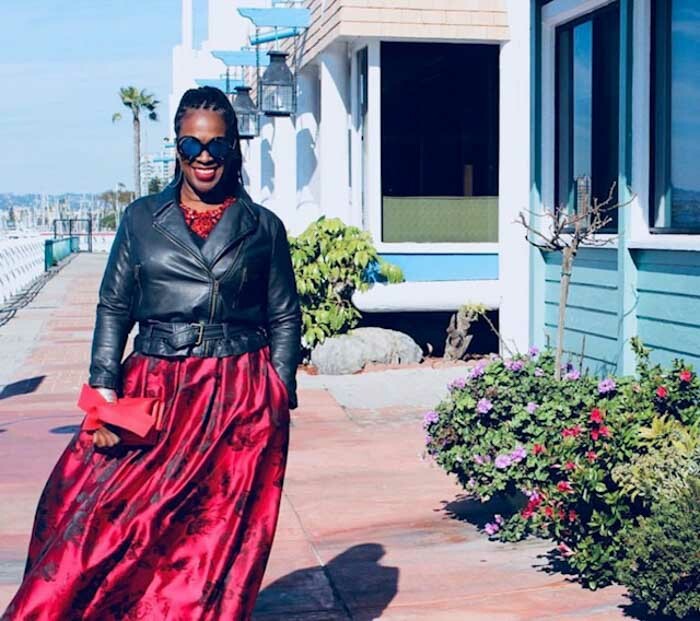 I am the enthusiastic owner of Stylist Paradox, a multifaceted business providing personal and special event styling, closet cleanses, and content creation for my life and style blog. I am a staunch believer in community over competition amongst women and try to live that way every day. I also am a public servant, speaker and I mentor young women. I belong to the “fly” fifties age group. 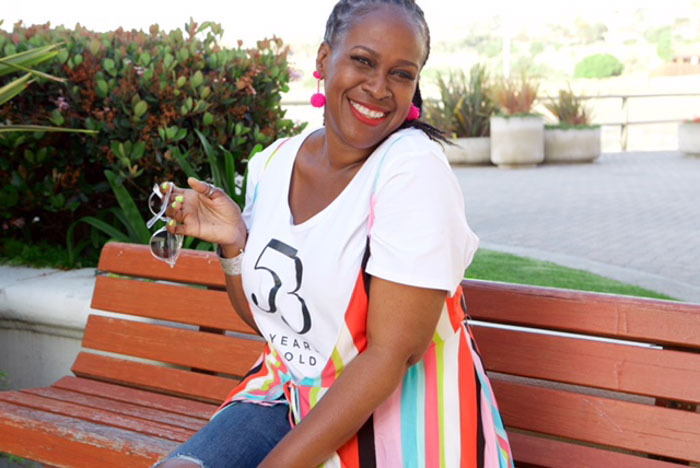 I am a vibrant 53! I think being the youngest of six children automatically put me in the mindset of having an eternally youthful spirit. 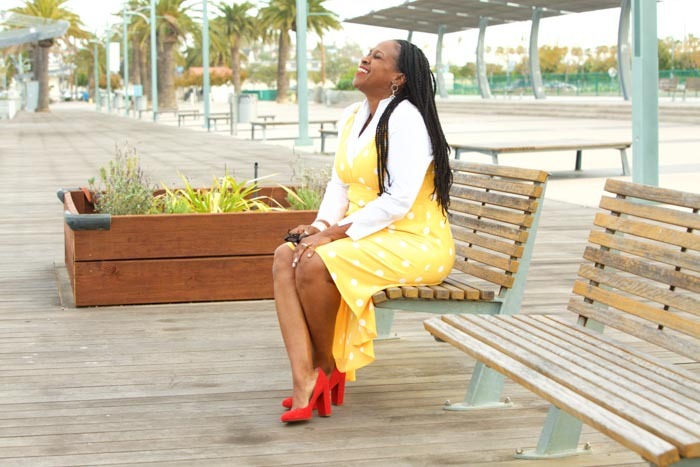 Why did you start a personal style blog? 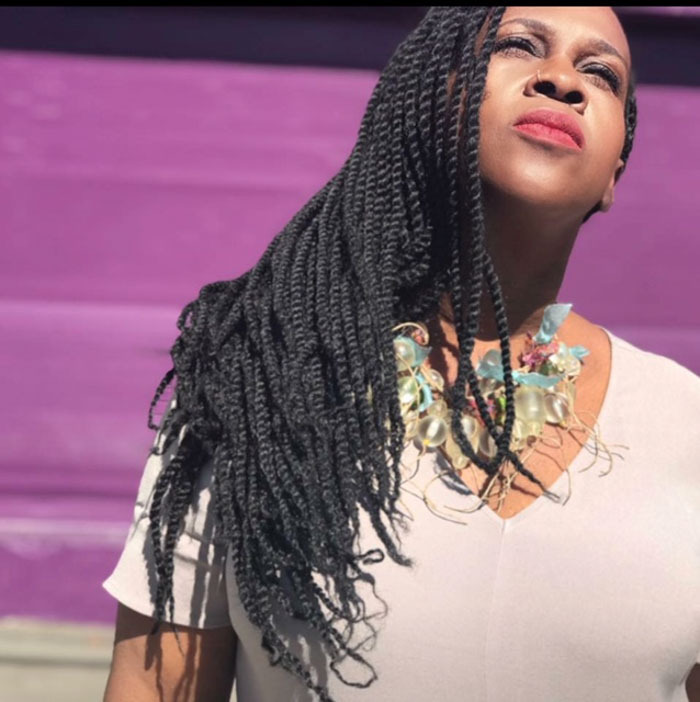 My blog, Stylish Paradox began when I started a personal styling business after my youngest child was in her last year of college. I felt it was time for me to move forward with doing something I was passionate about. My style can’t really fit neatly into a box. That is why I use the term “paradox”, because you NEVER know what you might get from me! One day edgy, the next romantic, bohemian, etc. I love it all! I live in Los Angeles, California, and am a true native of the City of Angels. I think the carefree, laid-back atmosphere has definitely had an impact on my style. I’m not really one to layer up because of the weather here, so I don’t really own a lot of outerwear. Well, not signature. But what you’re definitely gonna get from me is something “stylish”. It’s in my DNA. Both of my parents were stylish dressers. My father was a man of the cloth, and very dapper. My mother was a school teacher, who at one time sewed most of the clothing for her first four children. My mood has everything to do with the outfit choices I make on a daily basis. Unless of course there is a specific dress code. But even in that instance, I add a little Julie on it! If I am feeling down, you’ll usually see me in bright colors as a mood lifter. It works! I definitely take my body type into consideration when dressing. Not everybody looks good in boyfriend jeans or that spandex dress. I believe everyone should wear clothing that compliments their body type, and not just wear what is trending. I love, love, love color! It makes me happy! I am a curvaceous (size 14) woman, who has an hourglass figure. I am 5’6. I think it is important to accentuate your curves. Don’t hide them. That doesn’t mean wear tight clothing, per se. What it means, for example, is to belt oversized clothes or dresses so it doesn’t give you that potato sack look. 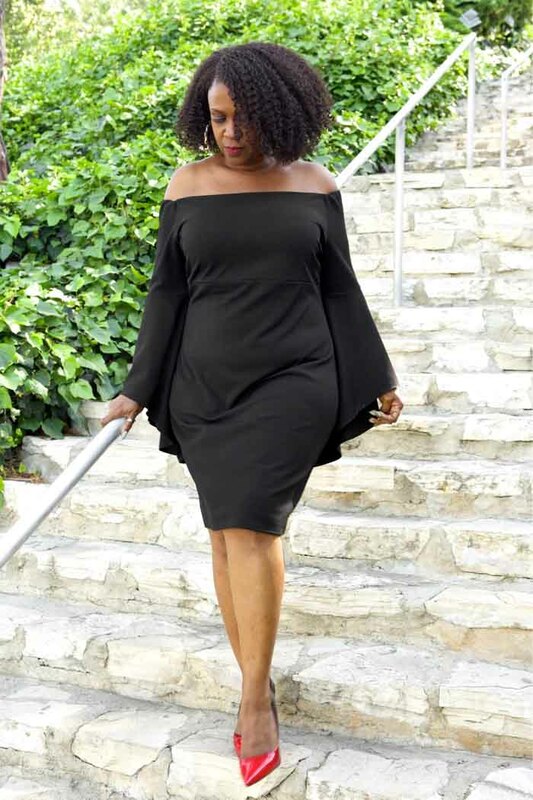 I believe the one type of clothing that is most flattering for my body type is the wrap dress. Yes, I do. 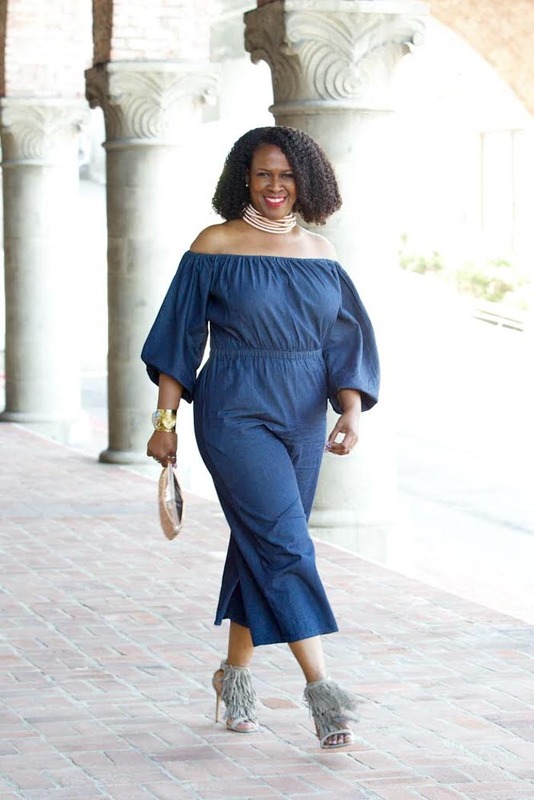 I love Who What Wear, INC., Zara, Eloquii, and Asos. 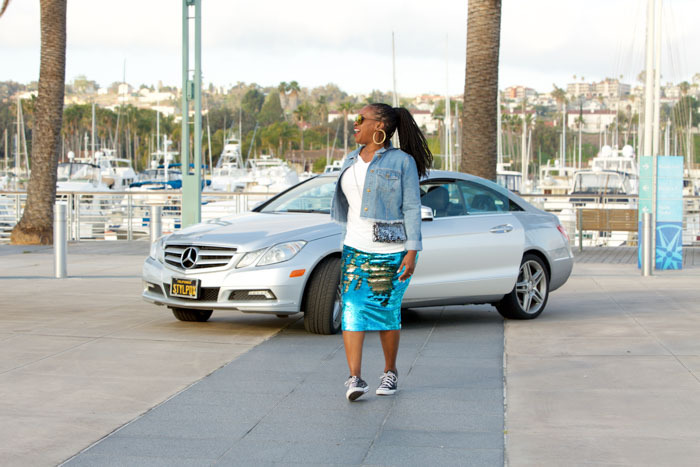 Has your style changed at all after turning 40. I think my style has changed slightly, in that I am a little more daring. I’ve always been a “dresser”, but the more daring side has occurred with age and not really caring what other people think anymore. I’ve just got to be my authentic self. I do believe in dressing appropriately to a degree. Of course, it wouldn’t make sense for a 70-year-old women to don short shorts, right? So, I get it. But what is more important is that you dress your body type. I don’t wear skin-tight pencil skirts anymore like I did in my twenties because it just isn’t complimentary to my body type in my fifties. But, I can wear the same skin-tight pencil skirt with a flattering tunic blouse and a belt that cinches in at my waistline and look fabulous! At this stage, I’m more interested and also have more time to devote to my love of style. 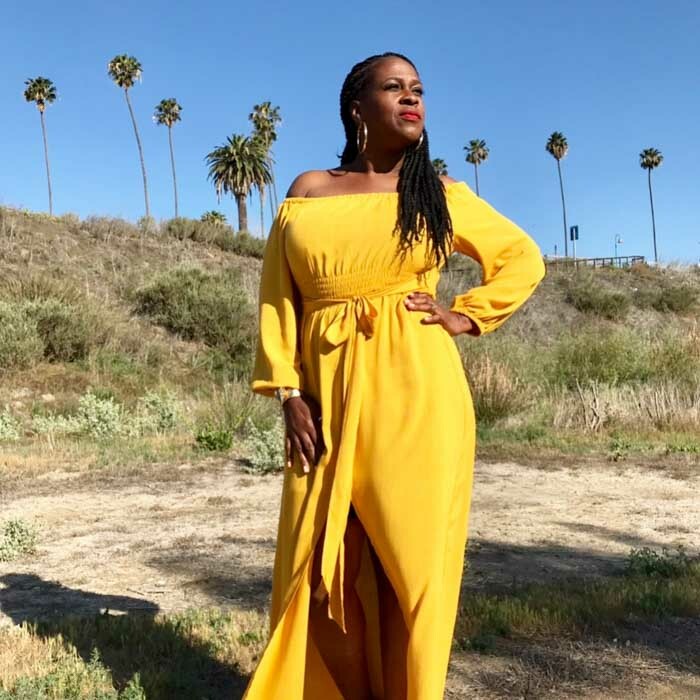 It’s important at this stage in my life to look my best, not only because it is just something I love to do, but I feel it inspires women of my age to continue to put their best foot forward. To be honest, I’ve just really begun to practice a regular skincare regimen. I’m in love with Tula and Trufora skincare products. I use a facial cleanser every day and a skin exfoliator at least once a week. As far as make-up is concerned, concealer is a must every day. My favorite is MAC’s Pro Longwear Concealer in NW45. I also use a primer (Wet and Wild’s Face Primer) and a setting spray by NYX (Matte Finish Setting Spray), when wearing a full face of makeup. I also love red matte lipstick and will not wear any shiny lippies, ever. My favorite matte lipsticks are MAC’s Retro Ruby Woo, Relentlessly Red and Retro Feels So Grand. I’m so loving the bohemian trend and vibe! I consider myself to be a closet hippie so this is right up my alley! 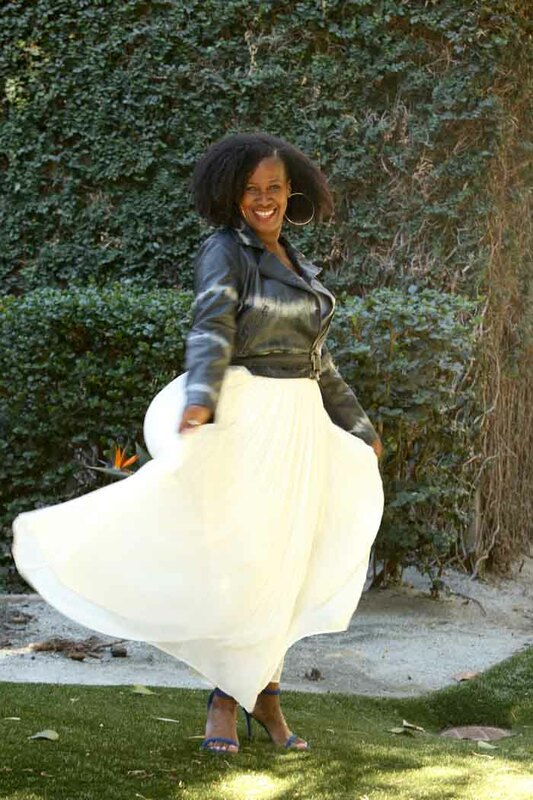 I love the peasant blouses, flowing fabrics and that free-spirited vibe! I just purchased an amazing Free People blouse from TJ Maxx and it’ll be in regular rotation, starting…..NOW! Be your authentic self. With authenticity, comes a sense if confidence. Shop your closet. You never know what gems are your closet that you are not utilizing. Mix clothing items that are timeless and trendy for some edge. Don’t be afraid to be a little daring. Wear color. Black can be dull. Or if you have to wear black, make sure your handbag and/or shoes are colorful. Or throw on a colorful scarf! Do you plan to continue with blogging and how do you see your blog developing over the coming years? Yes, I do plan to continue with blogging for at least the next five years. My hope is to reach larger numbers of women who want to be inspired and styled to be the best version of themselves. 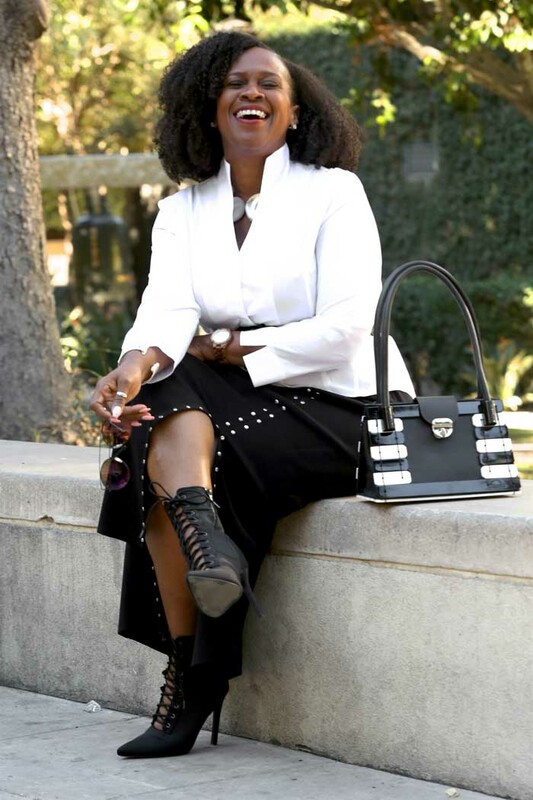 See more of Julie’s stylish wardrobe at Stylish Paradox as well as @_stylishparadox on Instagram! 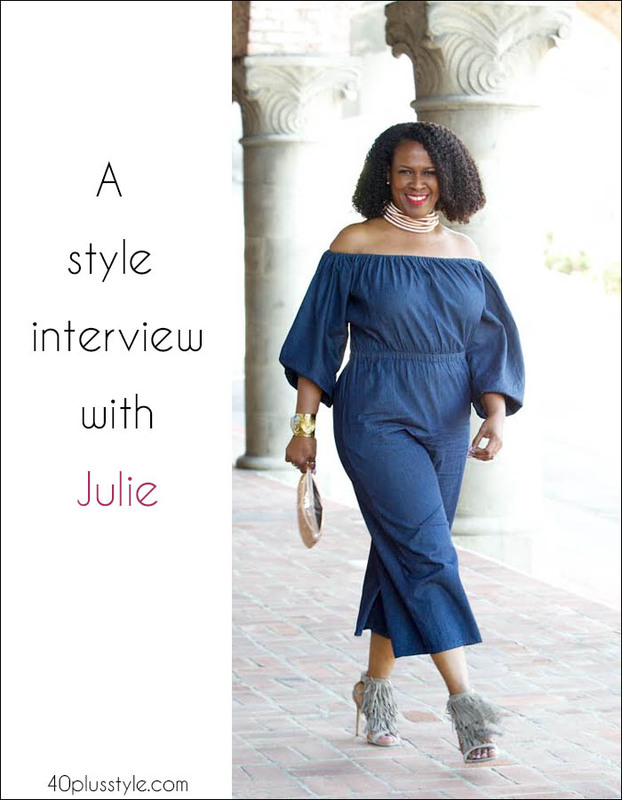 If you’ve been inspired by Julie, there are more fabulous interviews here from stylish women full of ideas and inspiration. Which of Julie’s outfits is your favorite look? What a fantastic woman! She looks soooo good. She oozes life and pleasure and confidence. It is amazing how she changes everytime she has her hair differently. Love all her style choices. I even feel like a kindred spirit. With two exceptions: 1) I don’t like boho and Julie does and 2) I have a different body shape. But in mind we are the same. 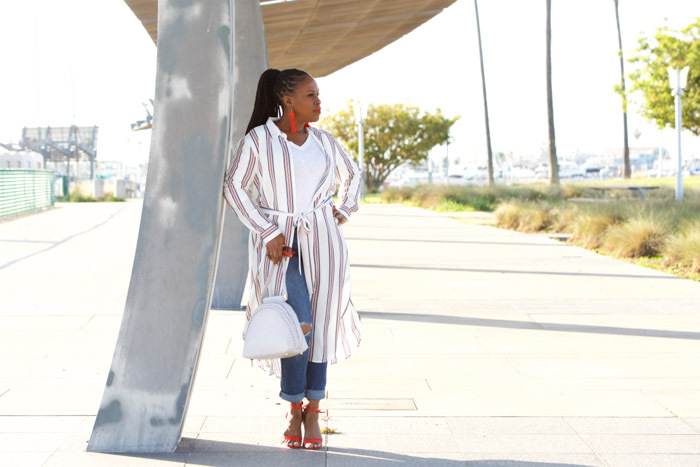 Previous post: The best accessory trends for Fall 2018 that will transform your look!